This page is an overview of how to hide or display attributes and sections in Question types via the init options. The options override each other, with base_question_type being the least specific, question_types being more specific and question_type_templates being most specific. In order to know which attributes and attribute sections exist, you can load Question Editor API with global_template set to debug in the init options. 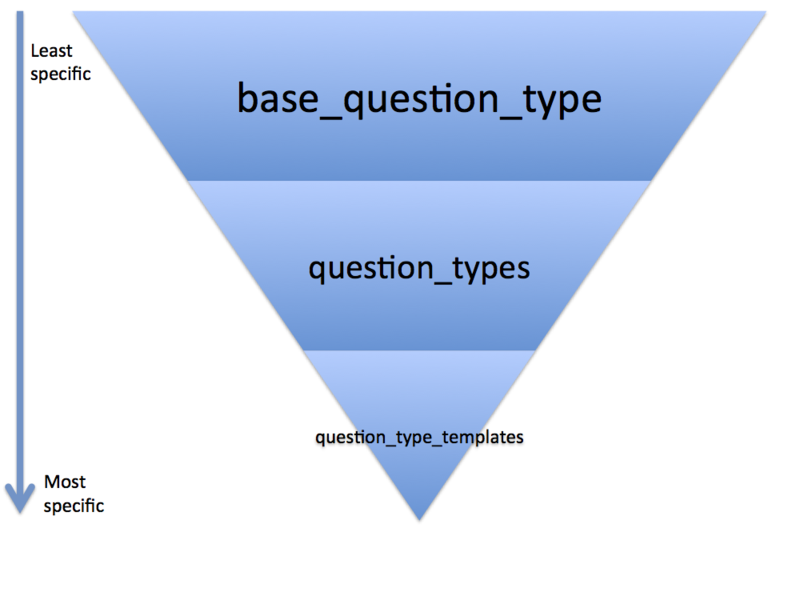 base_question_type specifies settings which are applied to all Question types, unless they are overwritten/extended by question_types or question_type_templates. If you add the base_question_type option shown in the preview, the penalty_score and multiple_responses attributes would be hidden in all Question types. stimulus would not be hidden as it is specified in the shown array as well. The hidden_sections specify that the more options heading and divider are hidden for all Questions, whereas the more options content is displayed as it is specified in shown_sections. question_types specify settings which are applied to certain Question types, unless they are overwritten/extended by question_type_templates. The settings in the preview would result in the following: multiple choice Questions would inherit penalty_score and multiple_responses as hidden attributes from base_question_type. This would be extended by stimulus. However, penalty_score would be removed as it is specified in the shown array. The end result would be that stimulus and multiple_responses are hidden for multiple choice Questions. The hidden_sections array is merged with the array from the base Question type. When not specifying .heading,.content or .divider all these subsections of layout will be hidden. Sincemore_options.divider is specified in shown_sections, the dividing line will be visible. question_type_templates specify variations on base Question types. The settings in the preview would result in the following: MCQ - Base Question would inherit the settings specified in the mcq section of question_types. MCQ - New Template would inherit stimulus and multiple_responses as hidden attributes from question_types. These are extended by penalty_score. stimulus is removed as it is specified in the shown array, resulting in multiple_response andpenalty_score being hidden. Since more_options.divider is specified in hidden_sections the dividing line will not be shown for MCQ - New Template.